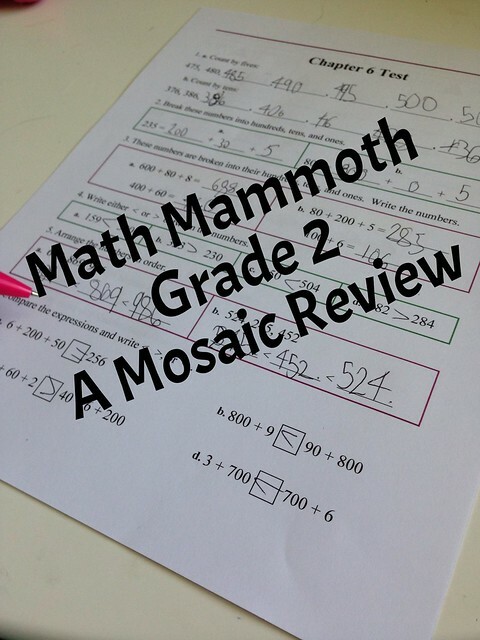 This past month I have had the opportunity to review Math Mammoth, Grade 2. I am going to give you my honest opinion and compare it with some of our previous and current curriculums. And, at the end I will ask her for an opinion, too! Gator is in second grade this year. We have previously used Oak Meadow K and 1 (a boxed all inclusive curriculum) and last year after deciding Oak Meadow 1 was not working -- we switched to Sonlight. While using Sonlight Core A (last year) Gator completed Horizon Math 1 by early April. I quickly bought Horizon Math 2 thinking I would just continue to do that year round; but, instead put it aside to use for this fall. I wanted to work more with her on basic facts so I took a friend's advice trying Calculadder. During the summer I wanted "more" so I tested her with Teaching Textbooks and she placed at Teaching Textbooks 4. Feeling there was no way my child was in Grade 4 math I purchased Teaching Textbooks 3. Now, here we are in September! We are currently using Sonlight Core B and mixing it up between Horizon Math 2, Math Mammoth 2, Calculadder and Teaching Textbooks 3. Math Mammoth is a complete math program offering many different grade levels. I am focusing my review on grade two. For this curriculum I received two student work texts (A and B), answer keys, tests and a year end review. - understanding the base-ten system within 1000. This is knowing the place value with three digits (hundreds, tens, ones) and skip-counting by fives, tens and hundreds. - developing fluency with addition and subtraction within 100. This includes addition, subtraction, word problems and re-grouping with addition and subtraction. They do also include clock, money, introduction to multiplication and graphs. The program is meant to be mastered. You focus on only a few topics per grade level and you focus on them for a long period of time. This uses a lot of mental math on the part of the student and very little preparation for the teacher. 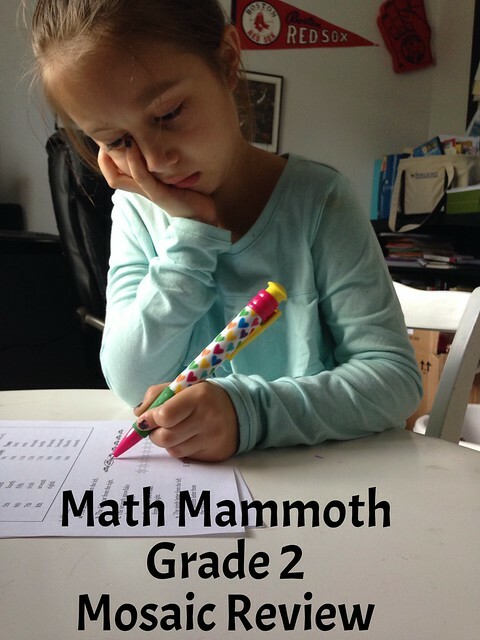 I have heard a lot of people discuss Math Mammoth among the homeschool groups. Like any curriculum it seems that people either LOVED it or could do without it. Most people I spoke with said it was pretty much grade level. It wasn't ahead but it wasn't behind. I was excited about trying Math Mammoth because everything was downloaded and all I had to do was "print" the assignment. I discussed what the assignment was a little. I loved how easy it was to prep and do! There was not a lot of clutter (added books on the book shelf, no huge list of "supplies" needed though it is suggested that you have a ruler, abacus and some base ten blocks). We sat down the first day and started. She was done in minutes. Gator loves doing things that are easy for her so she quickly did another page...and another page....and another page. I had her stop for the day and went to read up more about the program. The next day we sat down I decided to skip the worksheets and do the end-tests - surely I would learn what chapter we should start at...she breezed through the end tests of chapter 1, 2, 3, 4, 5 and 6. I was floored. Halfway through grade 2 Math in September?! Finally, later that week I sat down and had her do the remaining tests. She completed the entire Grade 2 curriculum (chapter tests not worksheets) in a weeks time. The following week I administered the Math Mammonth End of the Year Test for Grade 2. 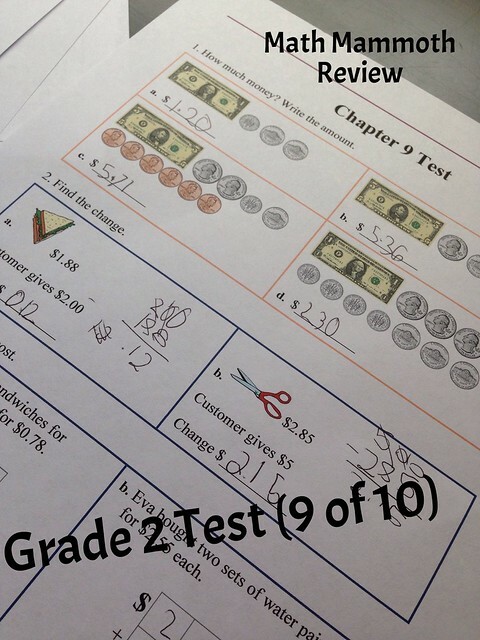 The recommendation for starting Math Mammoth Gr 3 is to gain a score of 80% or higher. Those that score between 70 to 80% can possibly continue to grade 3 depending upon the errors made and your judgement. Those scoring below a 70 should review grade 2 again. My daughter scored above 90%. The few errors that were made were timing based. 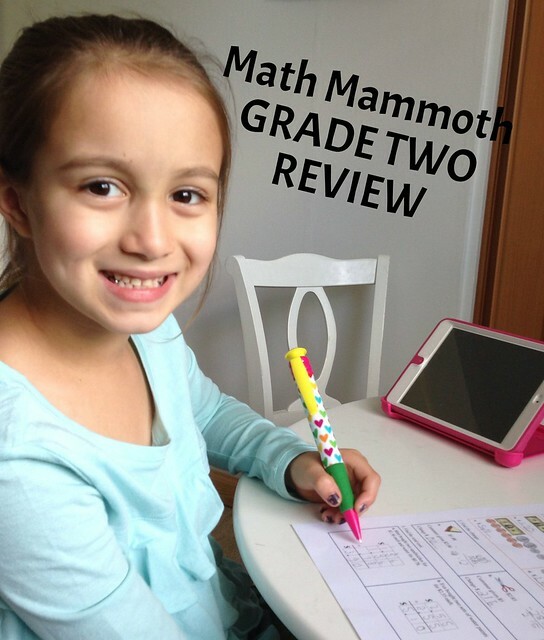 This review has been difficult to write because I really loved Math Mammoth. The layout of the program is amazing, the additional features (create your own worksheet) and ability to use for multiple kids (once you download it you own it. Have four kids? Use it four times)! I really want to write all positive things BUT I feel like I have to include the "why this grade two did not work for us" comments as well. My concern is that my daughter may not have been the best candidate to review Math Mammoth 2. I have used Horizon Math K, 1 and currently 2. I feel Horizon is more advanced and has caused some difficulty in swapping or testing out additional Math programs because of her knowledge already at age 7. If you are going to try Math Mammoth please use the placement tests as a guide. I really enjoy the layout, however, and look forward to trying out some of their free worksheets available online for my younger kids. I asked Gator which math program she liked the best: Horizon, Math Mammoth or Teaching Textbooks....she voted for Math Mammoth. She surprisingly liked Math Mammoth the best! She enjoyed the printed out worksheets (compared to the book) and her ability to skip around if things were too easy (though, you could do it with any math program). She has already asked to test out the next book. I'm not going to jump into purchasing it just yet but I will be strongly evaluating it for next year! And, when I do choose which level next year I'm going to go online and find which grade she places into instead of just assuming a second grader should be doing grade two. Lastly, I want to mention to you they offer Math programs for grades 1 through 12. You can purchase actual books, CDs or downloadable versions. The price varies slightly between them. Please hop on over to the Math Mammoth website to learn more about their products! This is linked with other Mosaic Reviews of Math Mammoth!